The ferocious beauty and grace of the creatures featured in the Ornate Dragon Dagger with Red Scabbard capture the eye. Medieval folklore is rife with tales of the fire-breathing beasts who wrought terror upon countless kingdoms. 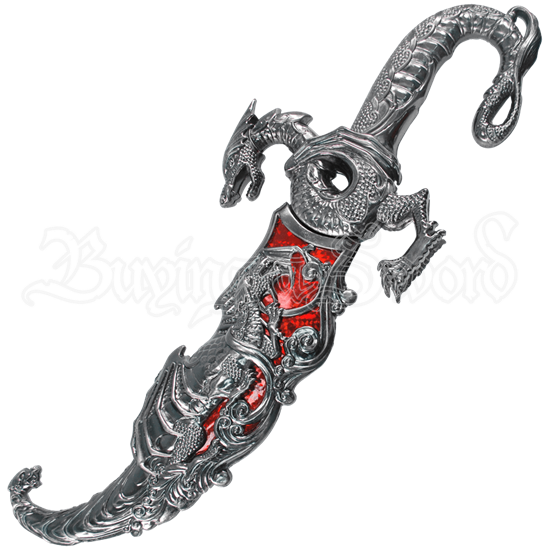 Although the intricate design of this blade makes it a beautiful piece for display, a trailing point blade offers some utility and function. A small fuller trails the spine partway. A cast metal image of a winged dragon forms the cruciform hilt of the dagger. The guard is comprised of the head, wing, and foreleg while its serpentine body curves gracefully to form the grip and pommel. Even more dragon themed imagery decorates the scabbard. Two more dragons confront the other amidst a whirlwind of clouds. A glimmering red underlay provides a striking contrast across the upper half of the sheath.